Do you watch the paranormal television shows that have become increasingly popular in recent years? Do you have a particular interest in things which cannot adequately be explained with logic? If you answered yes to either of these questions, then chances are that you’ve heard ofelectronic voice phenomena or EVP. Electronic voice phenomena are noises that are picked up using recording devices. EVP are generated electronically via sources such as static, white noise, or radio transmissions. They are not deliberate recordings of human voices, and they cannot usually be heard by the human ear. Electronic voice phenomena can only be picked up by amplifying the recording later on. Some people think that electronic voice phenomena are sounds made by spirits or disincarnate entities. Thus many people are interested in EVP recordings. Some people do not believe that EVP have anything to do with the paranormal. Instead they think that there are rational explanations. For instance, some people attribute EVP to apophenia. In other words, they think that the human brain looks for meaning or significance where there is none. Others link EVP to pareidolla. Pereidolla is what happens when your brain construes an arbitrary sound as a voice speaking in your mother tongue. Many skeptics believe that some EVP recordings are simply hoaxes. They also think that EVP recording could be the result of interference from CB radios, cell phones, baby monitors and television sets. People that believe that EVP recordings allow us to hear the voices of the dead talking tend to refute the explanations offered by skeptics. They argue that EVP have been recorded in rooms that were heavily shielded against interference from radio waves. What’s more, many EVP recordings are answers to direct questions. For people who believe in the paranormal, these facts suggest that EVP are not quite so easy to explain. It is not a good idea to attempt to record EVP if you are the kind of person who scares easily. You should only ever try to record EVP if you are prepared for a potential result. Also bear in mind that EVP recordings can sound very creepy, especially if you happen to believe they really are the voices of dead people talking. You may also wish to avoid dabbling with EVP or anything else paranormal if the dictates of your religion forbid it. In order to capture an EVP recording, you must find a suitable location. The location doesn’t necessarily have to be an obvious place such as a renowned haunted house or a cemetery. Nor do you have to make your recordings at night. You can attempt to record EVP at any time of day. You can record inside or outdoors. However, indoor recordings tend to have less background noise, and this increases the odds of capturing something. You should ideally attempt to record EVP at a location that makes you feel somewhat apprehensive. For instance, it’s a good idea to choose a room that always makes the hairs on the back of your neck stand up, or a place where the temperature is always cooler than it should be. Once you have chosen your location, make a record of any specific details such as objects in the room, temperature, people who are present, and background noise. There are two different kinds of device you can use to record electronic voice phenomena. The least expensive option is an ordinary battery-operated tape recorder that relies on mini tapes. If you choose to use a tape recorder, make sure it has an external microphone. That way, the noise from the internal mechanisms in the device will not interfere with any EVP recordings you may capture. If you use tapes, only record on one side. It’s also prudent to make sure the tapes have not been used before. Once you make a recording on a tape, you should label it with the time, place and date. This will help you to avoid confusion when you review your material. The other alternative is to use a digital audio recorder. This device is more technologically advanced than an ordinary tape recorder. It is also the better choice if you would like to analyze your data with your computer afterwards. You may also wish to consider investing in some EVP software if you choose to use a digital audio recorder. 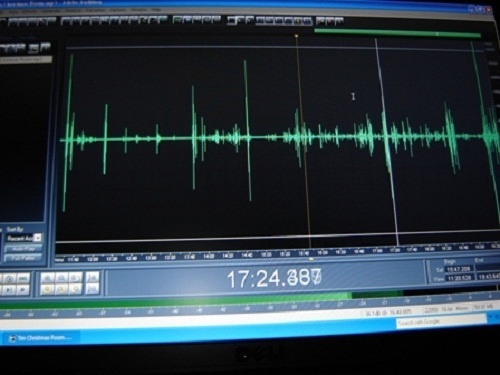 EVP software can tell you if there are any unusual sounds in your recording. It can also help you to isolate fragments of sound. It’s wise to invest in a good set of audio headphones to listen to your recordings later. This will help you to hear any potential electronic voice phenomena more clearly. It will also help you block out other noises that may be occurring in the external environment. You should use headphones to listen to your data regardless of which type of recording device you use to capture your audio. Once you have chosen a location and purchased all of the necessary equipment, you are ready to begin trying to record EVP. Some paranormal investigators recommend ensuring the room is fee of all background noise before you begin your recording. Others think it’s best to supply some background noise because this provides the spirits with a means to create words that make sense. Good types of background noise include a fan, a vacuum cleaner, a white noise machine, or running water. Make sure the room is completely silent apart from the background noise you have purposely chosen. You should also unplug all electronic devices that are not in use. Once you turn your recording device on, it is a good idea to ask questions. For instance, you might ask the person’s name, and find out if there is anything they would like to say. You may find it helps to prepare a list of questions before you begin the procedure. Pause for around thirty seconds after you have asked each question. This will give any disincarnate entities a chance to respond to your question. When you ask questions, speak as you usually would. There is no need to shout or whisper. You should also make sure you ask your questions in a respectful way, as you would if you were addressing another adult. If you would rather not ask any questions, you do not have to. People have recorded EVP simply by leaving a recording device in a quiet room for several hours. Once you have finished making your recordings, you’ll be ready to evaluate them. Make sure you use headphones to listen, and ensure that the room is completely quiet. This will make it easier to hear any EVP that you may have recorded. Bear in mind that listening to the recordings can take hours. What’s more EVP are usually short and the meaning is not always clear. EVP can sound mumbled, and they might not make sense the first time you listen. You should look for soft-spoken words or moans. If you think you hear anything unusual, rewind it back and listen again. If you listen several times, the words might start to make sense. You will need plenty of patience if you are going to attempt to record and analyze EVP. Do not worry if you are not very good at it initially. Recording and analyzing good EVP takes plenty of practice.